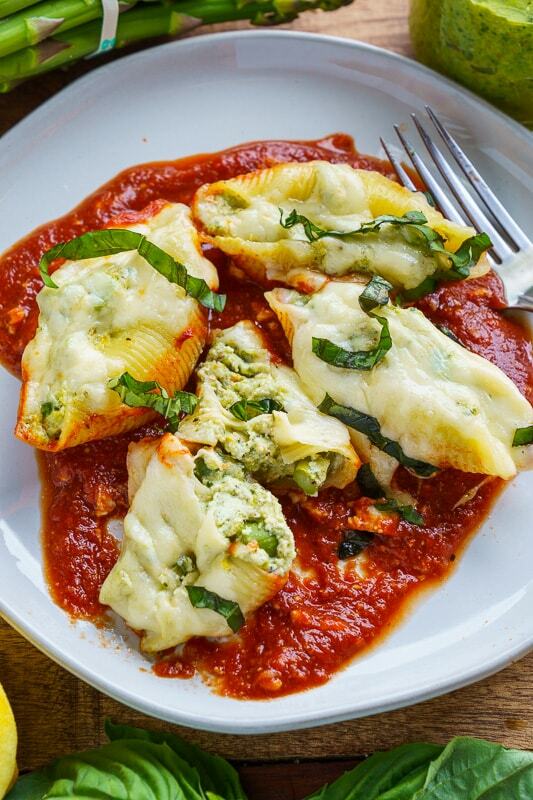 Bright, fresh, and summery asparagus pesto and cheese stuffed pasta shells in a marinara sauce all covered in melted cheese! Bright, fresh, and summery asparagus, pesto and cheese stuffed pasta shells in a marinara sauce all covered in melted cheese! 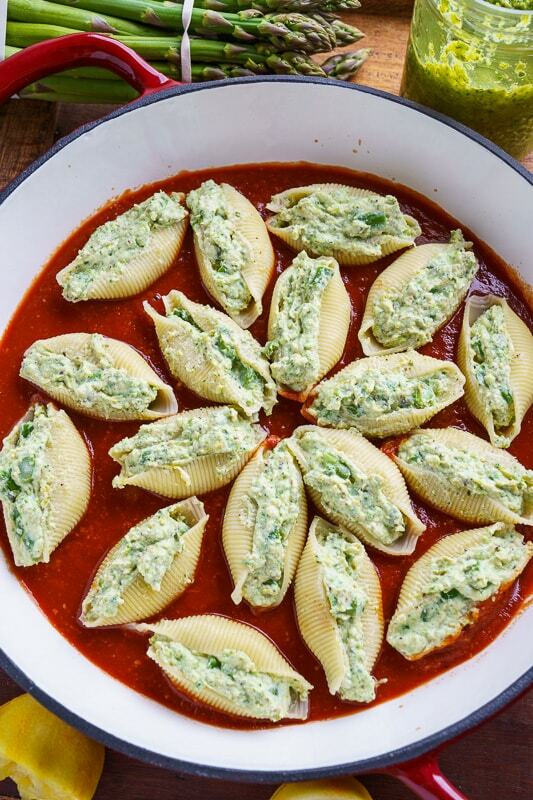 There are so many ways to enjoy some spring asparagus and these asparagus pesto and ricotta stuffed shells are what I am currently crushing on! Jumbo pasta shells are stuffed with huge chunks of asparagus along with a tasty asparagus pesto giving you a maximum asparagus experience! 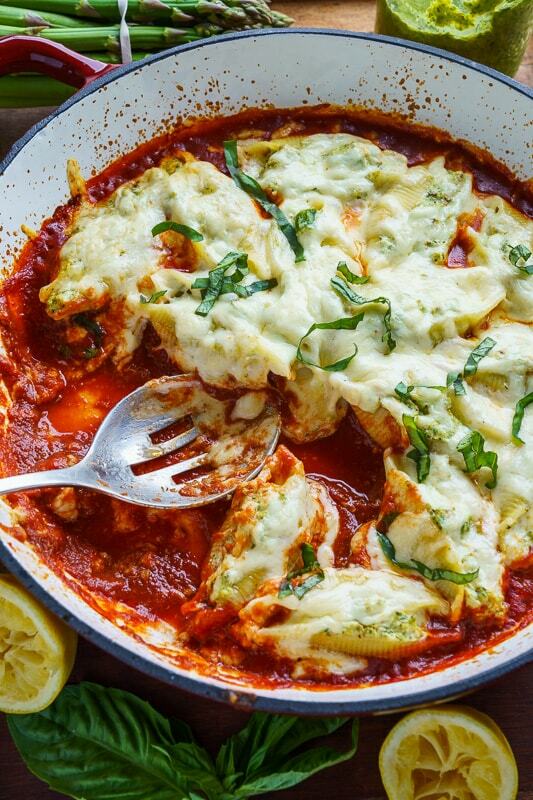 The base of the filling is ricotta cheese along with lemon, basil, parmesan and pepper; it’s so good that I can hardly resist devouring it by the spoonful as I stuff the shells. (One spoonful for the shells, one spoonful for me… ???? no one saw that!) The shells are placed in a fresh marinara sauce, covered in mozzarella and baked until the cheese is all melted, ooey, gooey and stingy! Yum! This asparagus pesto and ricotta stuffed shell recipe is my new favourite spring meal! The asparagus, pesto and ricotta stuffing! Start cooking the pasta as directed on the package until just tender (a little under cooked), before draining and tossing with a bit of oil to prevent sticking. 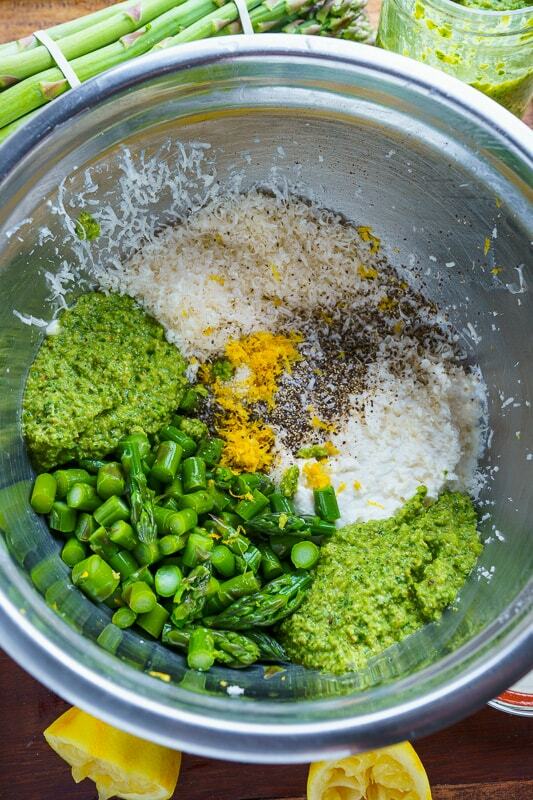 Mix the ricotta, asparagus, pesto, parmesan, lemon zest, salt, and pepper. 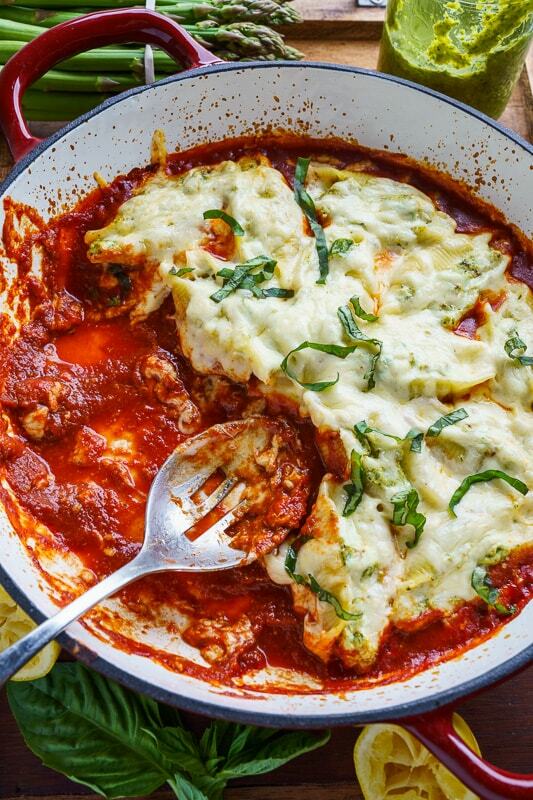 Spread the marinara sauce over the bottom of a large baking pan, stuff the shells with the ricotta mixture, and place them in the marinara sauce in the pan with the open side up. 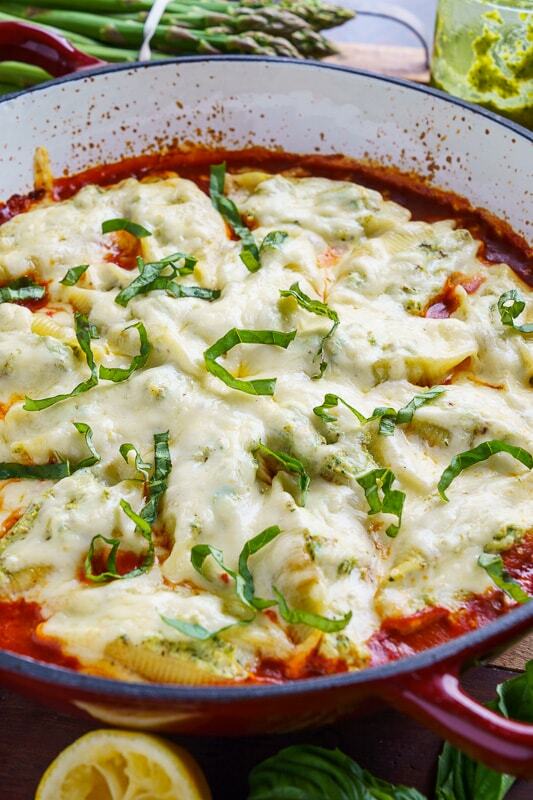 Sprinkle the mozzarella over the top and bake in a preheated 350F/180C oven until the cheese has melted and the sides are bubbling, about 10-15 minutes, before removing from the oven and serving garnished with the basil.